The United States is in an agricultural bind. Farmers are retiring at alarming rates, profits are down, and starting a new small farm takes guts and money. The next generation faces mounting debt and a lack of affordable farmland, but also inherits a growing public weariness of dominant production models that rely on ecological shortsightedness to keep bad food cheap. With or without the infrastructure in place, there is demand for healthy food that doesn't require a war on nature to produce. New farmers are rising to the challenge, but they need all the support they can get. The Stone Barns Center for Food and Agriculture, in Terrytown, N.Y., is a non-profit organization working to promote sustainable, community-based food production. This includes operating a farm, CSA, restaurant and educational resource center that’s open to the public. 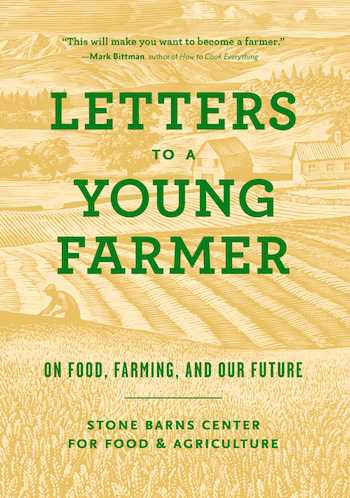 Last month, the Center released Letters to a Young Farmer—an anthology of essays and letters by influential farmers, writers, and leaders in the sustainable food movement. Writing to inspire the next generation of farmers, contributors include Barbara Kingsolver, Bill McKibben, Michael Pollan, Dan Barber, Temple Grandin, Wendell Berry, Rick Bayless, Marion Nestle and 24 others. The United States is on the cusp of the largest retirement of farmers in U.S. history, with more farmers over the age of 75 than between the ages of 35 and 44. Letters to a Young Farmer aims to help beginning farmers succeed through advice and encouragement, while inspiring all who work in or care about the food system. Food Tank: Why do young farmers need encouragement? Farmers are becoming an endangered species. The number of farms and farmers continues to shrink, and farmers are aging off of the land at an alarming rate. The average age of a farmer in the United States is 58.3 and climbing, and only six percent of farmers are under the age of 35. Young farmers need encouragement because our society doesn’t value them the way they should be valued. “You’re just a farmer” is the common refrain. Barbara Kingsolver, Wendell Berry, and Bill McKibben all write about this in the book. We’ve also lost many agricultural traditions based on community, a common history of stewardship and hard work. To support the kind of dignified labor and environmentally sound land stewardship that will help us create a more sustainable farming system, we simply may have to pay more for our food. According to the USDA, in 1960, Americans spent 17.5 percent of their income on food. By 2013, that had dropped to 9.9 percent. As a country, we’ve grown accustomed to cheap food—food that is not only inexpensive, but food that doesn’t taste good and isn’t good for us. Paying more for quality, nutritious food (and helping those of lesser means gain access to it), grown by farmers able to earn a living wage and provide health care to their workers—that would go a long way to helping raise us all up. What unique obstacles do young farmers face? Bill McKibben writes about surviving the “carbon binge,” and the challenges that a changing climate will bring to farmers who grow our food. Marry this with the challenges of finding affordable land to farm, paying off student loans, the dearth of start-up capital and a lack of regional agricultural infrastructure in some parts of the country, and you have a daunting set of obstacles that most young farmers face. It is hopeful to note that H.R. 1060, the Young Farmer Success Act, a bipartisan bill sponsored by Rep. Joe Courtney (D-CT), Rep. Glenn Thompson (R-PA), and Rep. John Faso (R-NY), was reintroduced in the House of Representatives in February. This bill will help provide college loan relief to young farmers. So, some in Congress are paying attention, especially among them Rep. Chellie Pingree (D-ME), herself a contributor to our book. What are some of the most important areas for young farmers to focus their skills? At Stone Barns Center, we focus on two aspects of building soil health: one is through farming, and we teach and experiment with agroecology. The other is the concept of creating what we call a farm-driven cuisine in America—catalyzing a culture of eating based on what ecosystems, including farms and their soils, need to be healthy and regenerative. Young farmers need to focus not just on the practical skills to grow, harvest, and sell their products; they also need to focus on building strong connections to their communities, sharing their deep love of land and place, and helping people understand the value and importance of farming done well. Which letters inspired you the most? So many of the letters and essays are extraordinary and inspiring and deeply moving. They flow with humor and insight, gratitude and humility. I love the wry wit of Barbara Damrosch, Mary Berry, Bill McKibben, and Gary Nabhan, and the lyrical insights of Raj Patel and Barbara Kingsolver. I was drawn to Amy Halloran’s line, “Eating is hunting in nature for food.” It pulls you back to the bond that we need to have with the earth. It is primal. I appreciate Wendy Millet’s articulation of her “hundred years” value, the idea of taking a long-term perspective on economically and ecologically sustainable management. What were the most common themes you found in the letters? Bridging the gulf between nature and agriculture, between land conservation and food production—and finding the path toward to a more sustainable future. Renewing respect for farmers in a society that has taught children farming is a lowly occupation, and in a country that was founded by and largely composed of farmers until the mid-20th century. The changing nature of today’s young farmers, from generational—ones that inherited their roles and land—to the self-selected farmers who want to be agents of change. What have farmers’ reactions been to the book? “When are you putting together the next book? I want to write a piece.” This has been a heartening response. Sharing the stories about the people who grow our food and steward our lands and waters is powerful and important. Farmers are a hearty, optimistic, and determined breed. To have received their support and encouragement is a great honor and means that we are advancing our mission in an important and meaningful way. Stone Barns Center for Food and Agriculture is a nonprofit sustainable agriculture organization with a mission to create a healthy and sustainable food system that benefits all. The organization trains farmers, educates food citizens, develops agroecological farming practices, and convenes changemakers through programs such as a Summer Institute for High School Students and a two-day Poultry School conference. Letters to a Young Farmer is their first book. Farming is increasingly political. It’s difficult for a new farmer to access the land due to the Wisconsin Uniform Dwelling Code. The UDC makes it practically impossible to build an alternative and affordable homestead. The property tax penalizes land improvements. Land itself is expensive to purchase since the lack of a land tax allows rent to be capitalized in the selling price. Farm subsidies are also capitalized in the selling price. A first step toward leveling the farming field for small farming is to not renew the farm bill in 2018. Then put the bureaucrats in the USDA and DATCP out to pasture. They are about as useful as teats on a boar hog or a city dude from Milwaukee. Real farmers will not miss the bureaucrats. Industrial farmers with their history of farming the government will be at a loss. Good riddance. If healthcare is a right than healthy food is also. One way to insure people eat healthy is a good supply of cheap healthy foods and of course a limited and costly selection of bad foods. Farmers must be compensated for the cost of sustainable practices and market exposure. In my area Frito Lay contracts chip potato supplies (not a healthy food but this is an example of what could be done for any crop). They provide the seed potatoes and dictate the crop inputs and type of cultivation and harvest practices. In return the farmer gets a guaranteed handsome return per acre. Pay a farmer what he needs and he will grow whatever you want any way you want.